We provide a patent pending service that can evaluate either a new purchase or a replacement purchase of an indexed annuity (FIA) in the U.S. market. Similar to other CANNEX services, the formulae, rates and parameters specific to each contract are programmed and maintained within the service in partnership with the carrier. This service can be accessed either directly through the CANNEX service portal or through other third party tools that support planning, sales or compliance processes. In other words, the results can be deployed within any format or service the advisor or firm chooses to use. Insurance carriers will manage their fixed rates offered within deferred annuity contracts on the CANNEX exchange. These rates are guaranteed by the carrier and are updated on a real time basis. Where appropriate, they are also applied to the analytical processes to help ensure that results are up to date. 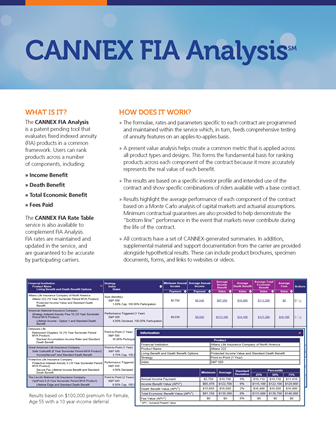 Rates and information can be accessed directly through the CANNEX Customer Portal or fed into a proprietary or third party process or application.